SUPERBLY PRESENTED! HOME ESTATE AGENTS are delighted to bring to the market this renovated three bedroom semi-detached property located on the cul-de-sac York Avenue near Urmston town centre. Our vendor has renovated the property and added a new kitchen, bathroom, re-plastered walls and new floor coverings. It has the added benefit of being offered with no vendor chain. The location of the property is only a short walk away from Urmston town centre and all the facilities on offer. 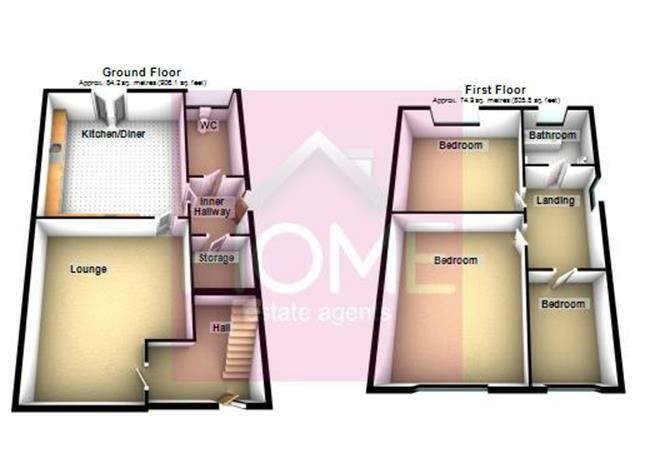 The accommodation comprises of hallway, lounge, large kitchen/diner and downstairs WC. To the upstairs are the three good sized bedrooms and a modern fitted three piece bathroom. The property is fully double glazed and warmed by gas central heating. To the outside front is a tarmac driveway and garden than can be utilized for off road parking. To the side is a further good sized garden leading to the extensive rear garden with block paved patio area. To book your viewing slot call HOME ON 01617471177. UPVC double glazed window to front. Television point. Wood effect flooring. Double panel radiator. UPVC double glazed French doors to rear. A range of fitted wall and base units. Butcher block style work tops. Gas hob. Overhead extractor fan. Built in electric oven. Splash wall tiling. Wood effect flooring. Double panel radiator. UPVC double glazed opaque window to rear. Bath. Wash hand basin. WC. Wall tiling to compliment. Decorative tiled floor. To the outside front is a tarmac driveway and garden than can be utilized for off road parking. To the side is a further good sized garden leading to the extensive rear garden with block paved patio area. To book your slot on our open day call HOME ON 01617471177.